There's something about the summer that makes me want to transform everything into a beach cottage. Since I don't live near the ocean, I have to recreate my love for the water at home! Limed oak, also known as cerused oak, is when a lighter pigment or wax [usually white] is rubbed onto an oak surface [any wood with an open grain works] and the pigment remains in the grain of the wood. What you get is a worn, cottage-y style that looks difficult, but is actually quite simple once you learn the technique. 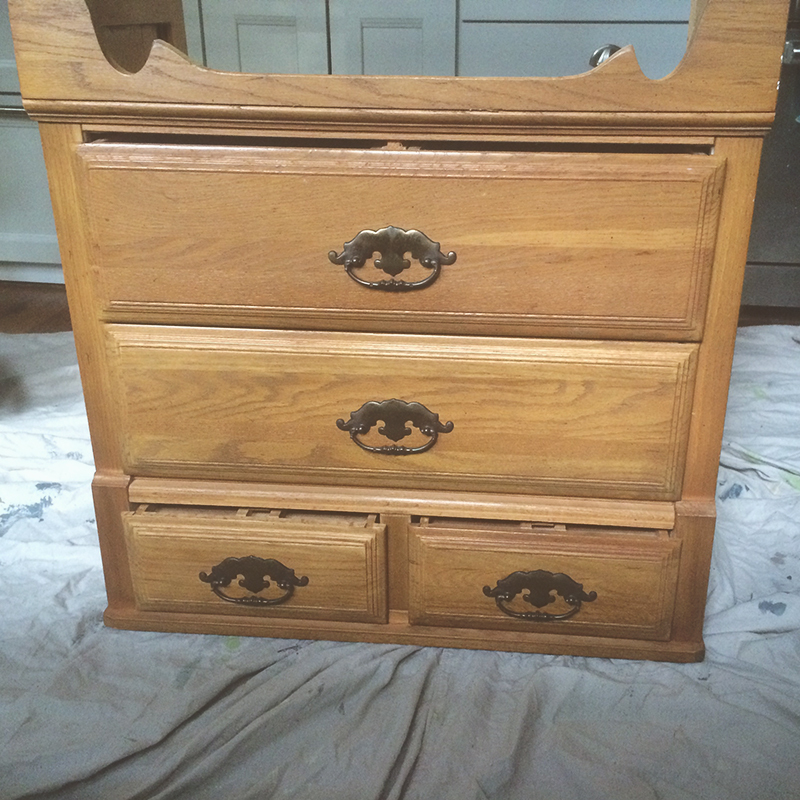 In this case, I took a small oak dresser [yes my 'before' pic has the dresser upside down- I always start a piece by painting it upside down so I can get the bottom painted properly before flipping it over and finishing the top]. The nice thing about this technique is it allows what would now be considered tacky oak furniture to become something completely new. 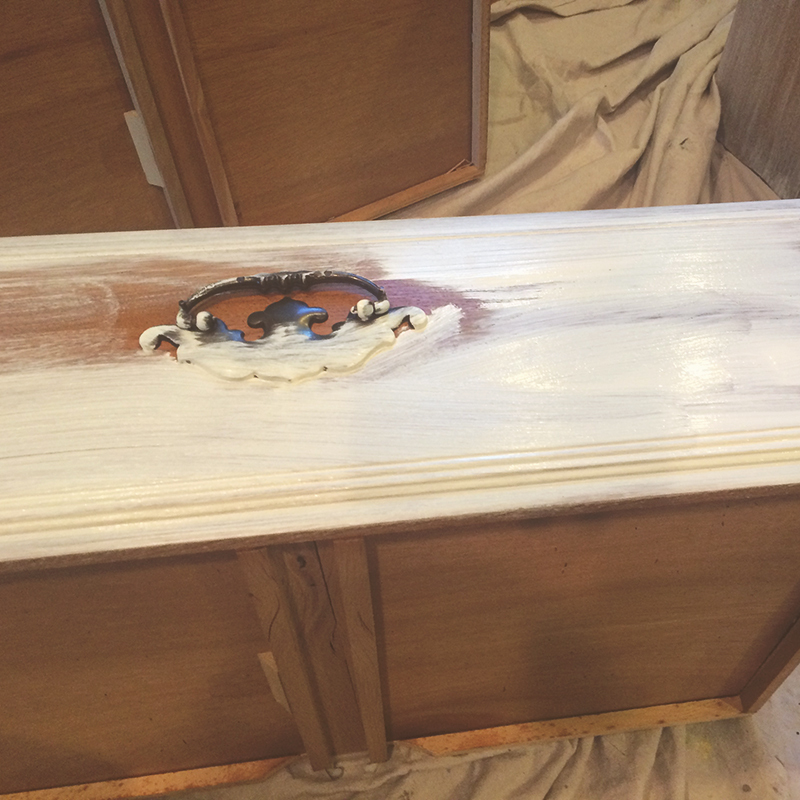 First, paint a small section of wood [in this case, one drawer front] lightly in paint. For this piece, I decided to paint over the hardware too, since I didn't think the brass look would work well with this paint style. Paint comes off metal quite easily, so if you decide you don't like the look, it takes no time to remove it. But trust me, it looks great! Allow it to dry for a minute or two [give it less time if you'd like to have a more subtle limed look]. Take a rag and very lightly wet it with water. If you let the paint dry a little longer, you may need more water, but start with less! Then, pull the damp rag across the wood, going with the grain. This part is where you need to take your artistic license and decide how much or how little paint to leave on the surface. I wanted mine to have a stronger white look, so I allowed the paint to linger longer, and then used water VERY sparingly. For the hardware, I lightly wiped off the main face of the drawer pull, but left it just cloudy enough so the brass didn't shine through too much. If you make any smudges with your rag, be sure to blend them out so the piece looks natural and the patterns of white paint and wood look organic. It definitely takes some practice, but it's not hard to get the hang of, I promise! It also helps to step back and observe the piece and make sure nothing sticks out in a negative way [ie: one giant white blotch that draws your eye to it isn't really something you want]. Once you've finished painting every piece, allow it to dry completely [which won't take long, since this project really doesn't use a lot of paint!]. Then you're ready to apply wax. When liming, I use a rag to apply wax because sometimes using a brush can alter the look of the limed paint process. Gently feel the dresser and make sure there are no thick globs of wax. After about 15 minutes, you're ready to buff the wax to your liking. I have to say, I was so excited to see the results of this piece! It was such an immediate transformation from something that felt so dated and tacky, to something with such character and natural beauty. The oak grain really comes through as a feature, and any carving details are perfectly accentuated by the white paint. The drawer pulls have a particularly aged look I love. The white paint sits snugly in the crevices of the pulls. It feels so artistic, and yet it was so simple! I simply placed the dresser up against a wall beside a vintage folding chair. It works so nicely against the cocoa and green walls. If it doesn't sell quickly, I'm definitely trying it out against my bluish-gray walls. It doesn't get any 'beachier' than that! My styling props were simple and continued with the theme. I just took my collection of shells [stored in vintage jars, of course], a random feather [probably also from the beach], and one of my favorite conch shells [which seems to make the perfect business card holder, who knew?!]. The vignette is simple but works so well with this piece. I'm truly just amazed by what a little white paint can do. It just took a bit of creativity and time [I think I had the entire piece completed in under three hours, not bad!]. This piece would make a really beautiful large nightstand, or a perfect piece for a hallway or entry way. I'm getting ready to post it on Craigslist, Etsy and in the shop so stay tuned! I have a feeling this one won't last long [though my Mom has already called dibs on it if it doesn't sell fast! ].